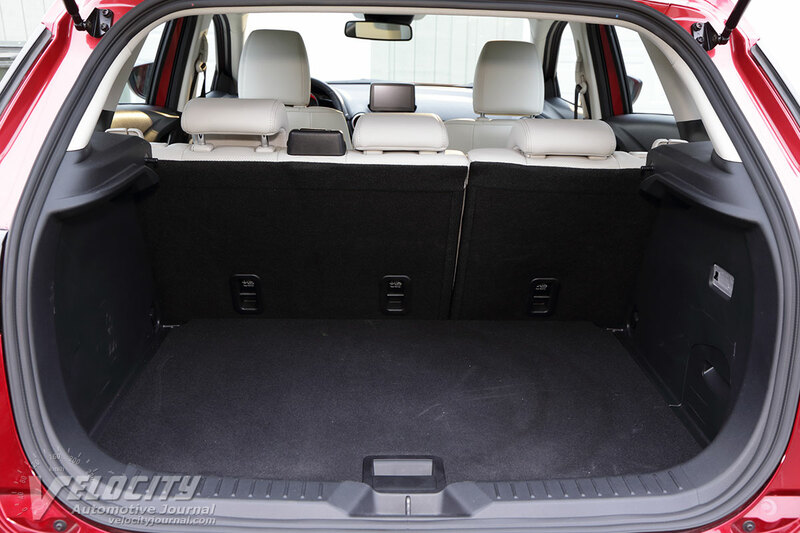 Affordable compact SUVs have become one of the most popular niches in the market. 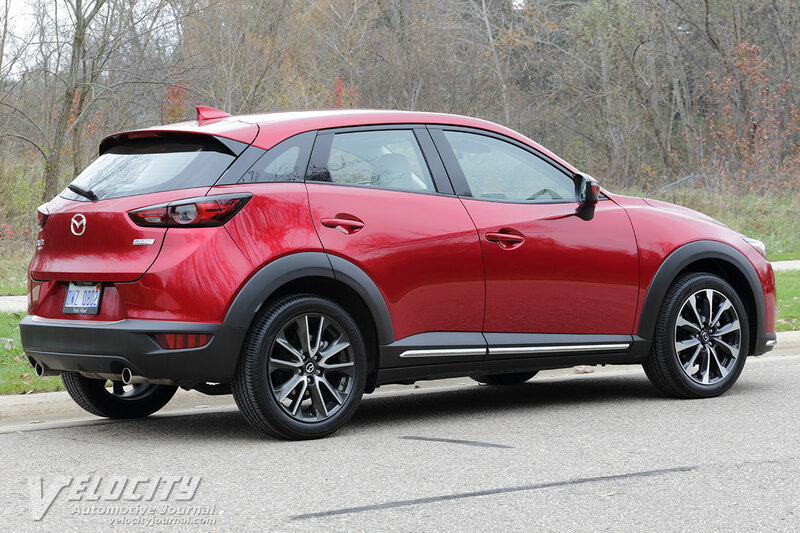 Mazda's CX-3 favors a sporty interpretation of the concept. 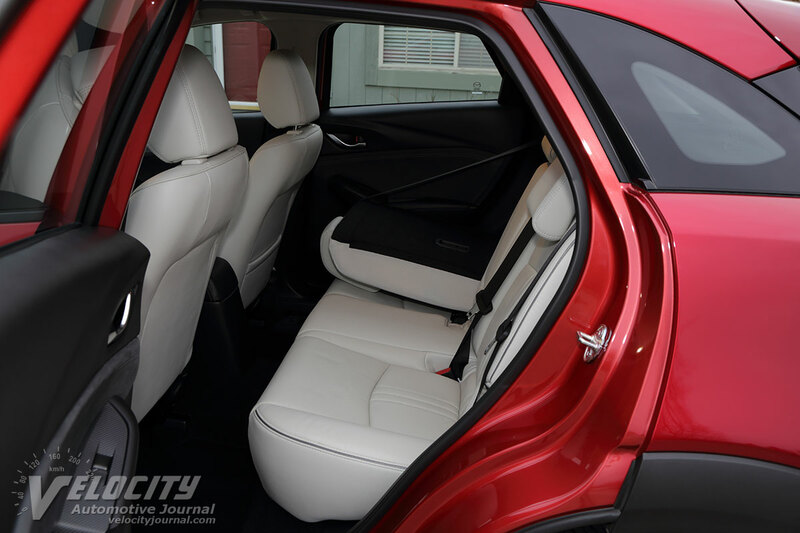 Available in three trim levels, the 2019 CX-3 Sport FWD starts at $20,390, followed by the Touring ($22,475), and the Grand Touring ($25,745). 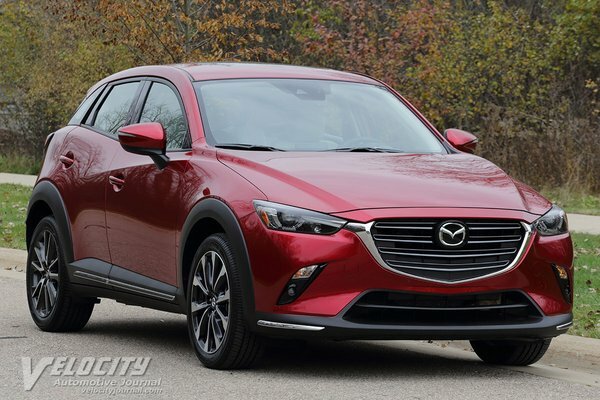 All-wheel drive is a $1,400 option on any variant. 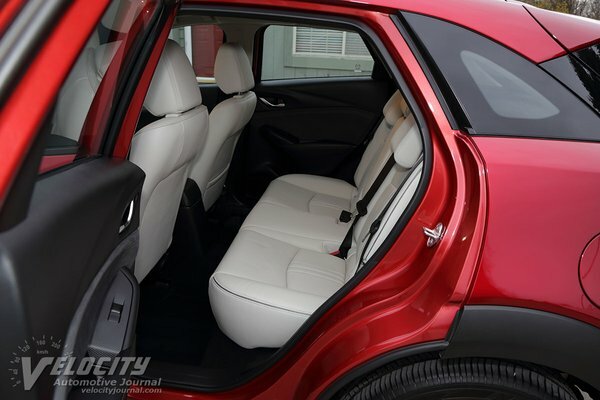 We tested a 2019 CX-3 Grand Touring AWD ($27,145) with the Soul Red paint ($595), Premium Package ($710), rear bumper guard ($100) and door sill trim plates ($100). Adding the $975 delivery and handling fee raised the total to $29,265. 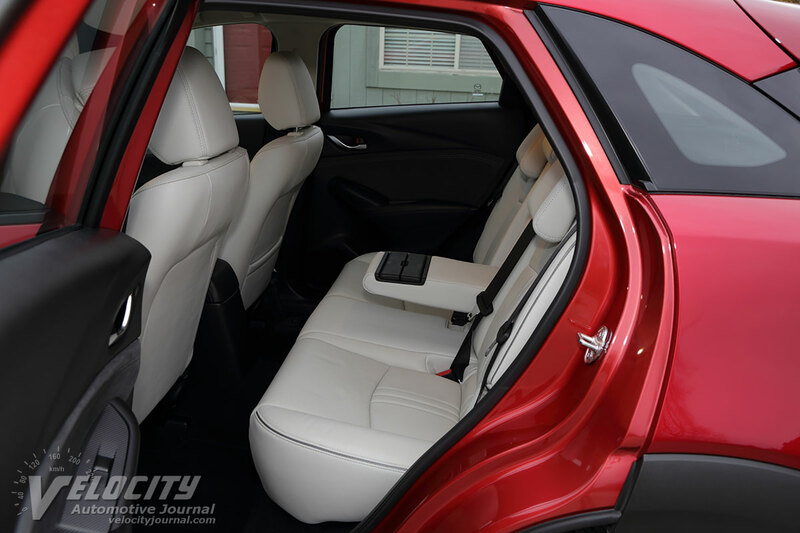 Notable standard and optional equipment in the Grand Touring model include: navigation system, moonroof, Bose(R) audio system, leather seats (heated in front), leather-wrapped steering wheel and shift knob, 18-in. diameter alloy wheels, LED headlights and fog lights. The Premium Package adds a 6-way power driver's seat with lumbar support, heated steering wheel, auto-dimming rearview mirror, and traffic sign recognition. Compact SUVs are often victims of cost-cutting that result in hard plastic interior panels and inexpensive trim. 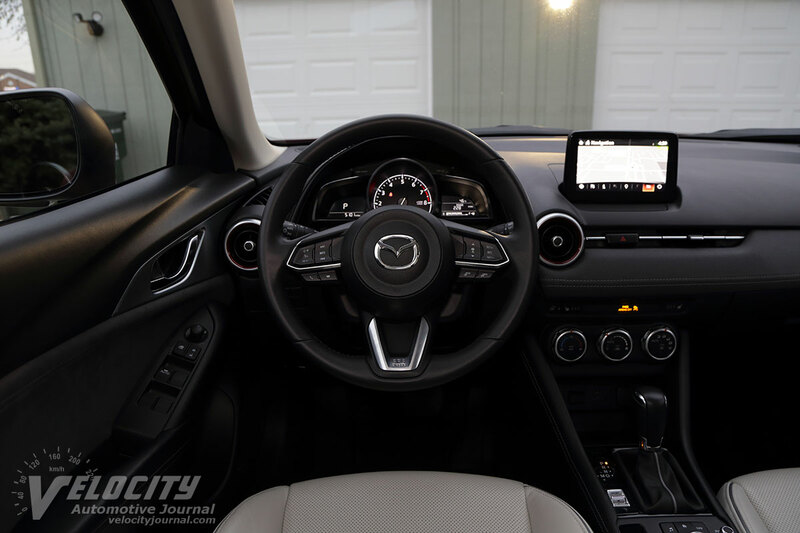 The CX-5 looks anything but cut-rate on the inside: a stitched padded dash, expensive-looking aluminum trim and door handles show Mazda's attention to detail. Leather covers the shift knob and the handbrake. Deep red-hued padding contrasts with the simulated carbon-fiber texture on the center console. The leather-wrapped steering wheel feels good to the touch. Integrated audio, phone and cruise control switches are conveniently located on the spokes. Within the analog tachometer is a digital speedometer. A trip computer display on the right shows fuel consumption, exterior temperature and fuel level. 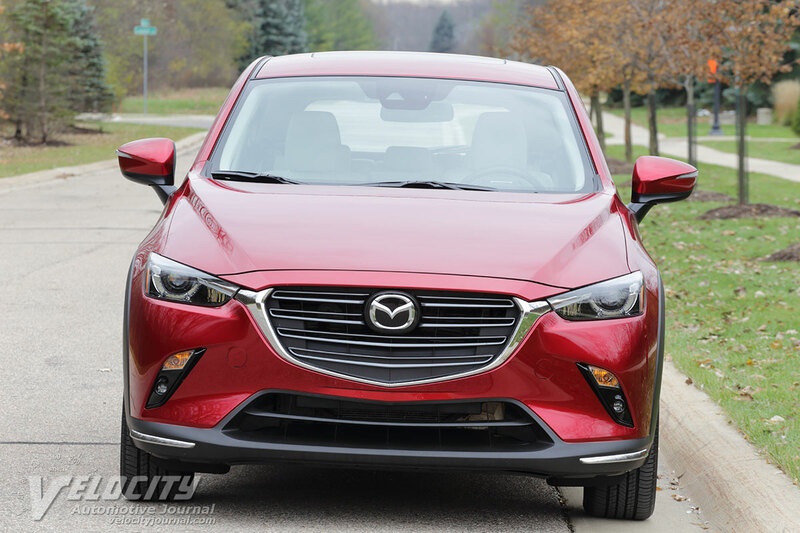 As is the norm with Mazdas, there is no coolant temperature gauge, just a blue indicator light. A head-up display projects both vehicle speed and object distance on the windshield, especially useful at night. Dual USB ports and a 12V outlet on the center stack charge portable electronics. Triple rotary knobs for the climate control system are clearly marked for easy operation. Aluminum-rimmed knobs next to the handbrake control the audio and navigation systems. 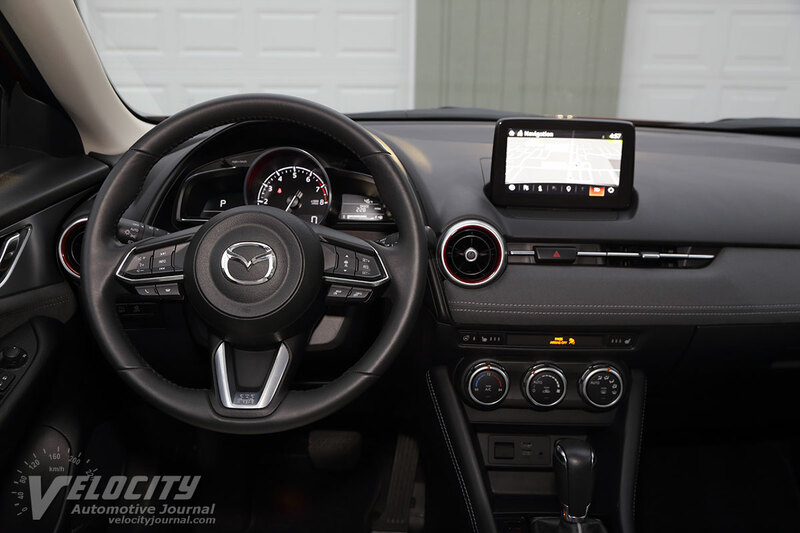 A tablet-style 7-in diagonal display on the dash shows audio and navigation maps. The navigation system map detail is remarkably sparse, so a portable GPS or smartphone is a superior alternative. 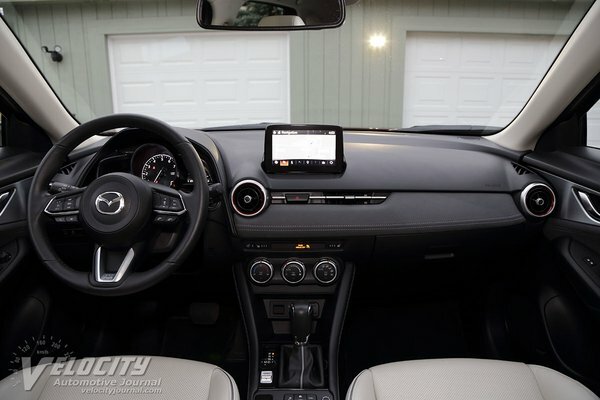 A multi-function knob and buttons on the console provide easy access to infotainment functions. 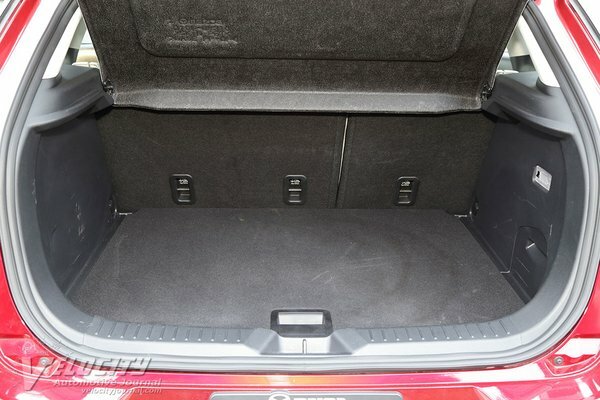 Storage is limited to door pockets and an open bin on the center console. The heated front seats provide decent overall comfort and support; soft perforated leather feels appropriately premium. 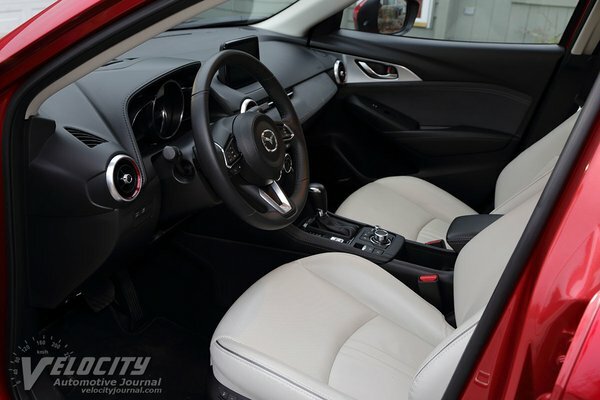 The driver's seat is 6-way power adjustable, but the passenger gets 4-way manual adjustments. Front headroom is adequate for occupants under 6-ft. tall. Rear accommodation are notably cramped, although seat comfort is above average if you can fit. All CX-3 models are powered by a dual overhead-cam 2.0L inline-4 mated to a 6-speed automatic driving the front or all four wheels. Rated at 148-bhp @ 6,000 RPM and 146 lb.-ft. of torque @ 2,800 RPM, the all-aluminum 2.0L uses direct injection, variable valve-timing for optimum low-RPM torque. With all-wheel drive, the EPA fuel economy estimates are 27/32 MPG (city/hwy.). Opting for the front-drive model boosts the EPA numbers to 29/34 MPG. 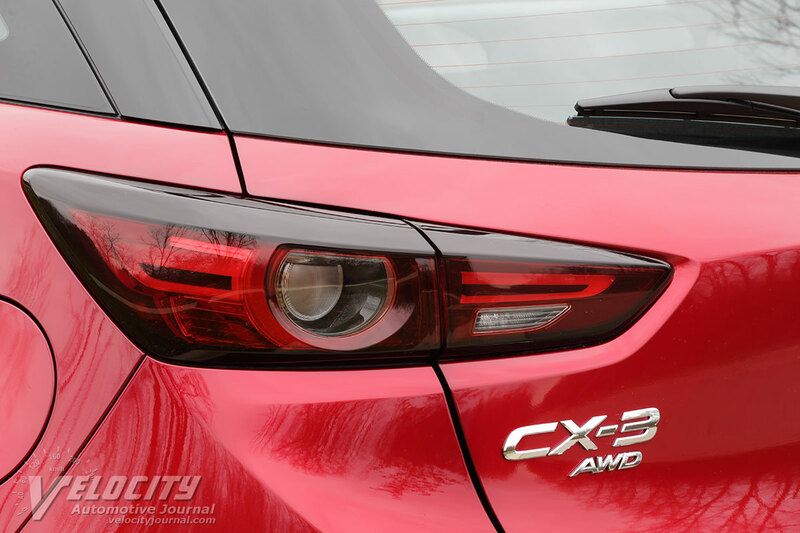 In our tested CX-3 AWD, we averaged 29 MPG in mixed city and highway driving. 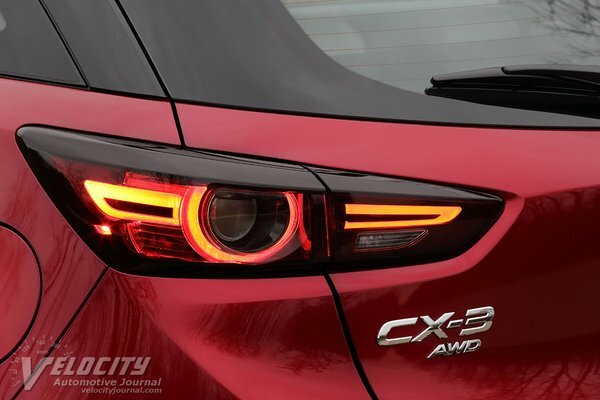 The CX-3 adheres to the typical suspension layout of MacPherson struts and stabilizer bar in front; at the rear is a torsion beam axle with coil springs and dampers. Four-wheel disc brakes are standard on all CX-3s: 11.02 in. dia./11.06 in. dia. (F/R). AWD models get larger 11.6-in. diameter vented front discs. Steering is via an electrically-assisted rack-and-pinion system. 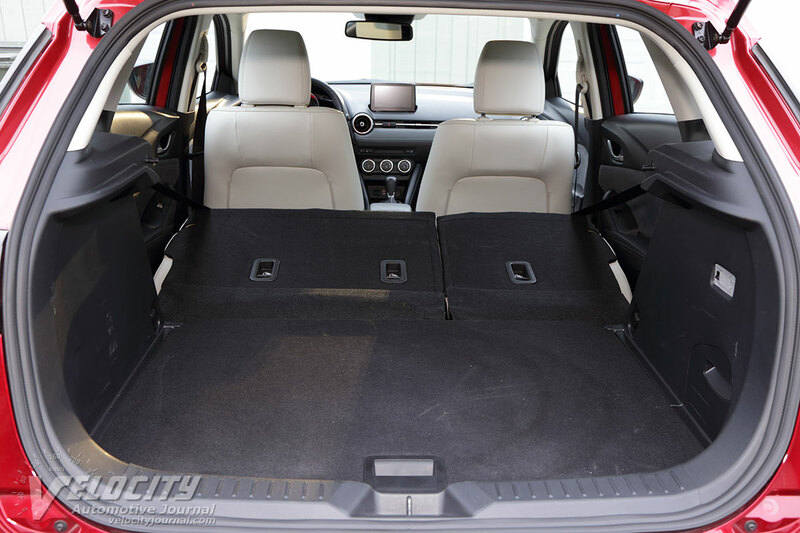 Grand Touring models are shod with 18-in. 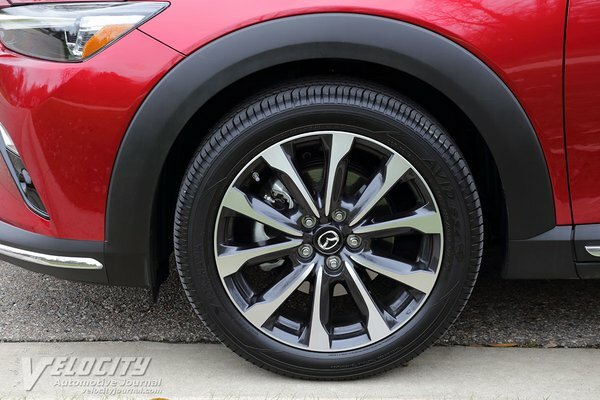 diameter alloy wheels with P215/50R18 Yokohama AVID S34 all-season tires. Other CX-3 models are equipped with smaller 16-in. diameter wheels and P215/60R16 tires. ABS, traction control, Dynamic Stability Control (DSC), and Hill Launch Assist are standard on all models. Curb weight is a surprisingly low 2,809 lbs. (FWD) or 2,952 lbs. (AWD). 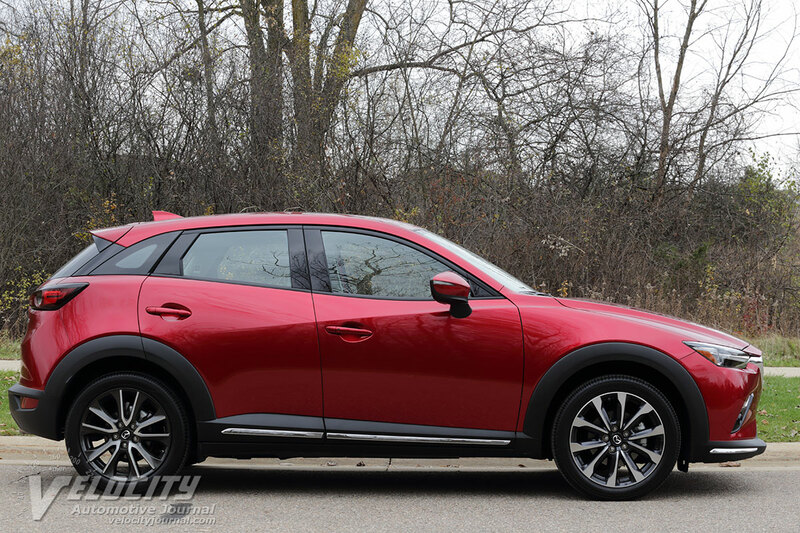 As Mazda promises, the CX-3 has the sharp reflexes and nimble handling expected of a compact hatchback. Quick steering turn-in response and low body roll ensure that the CX-3 can cut through city traffic with ease, but the tall transmission gearing and fuel-efficiency optimized calibration sap throttle response. 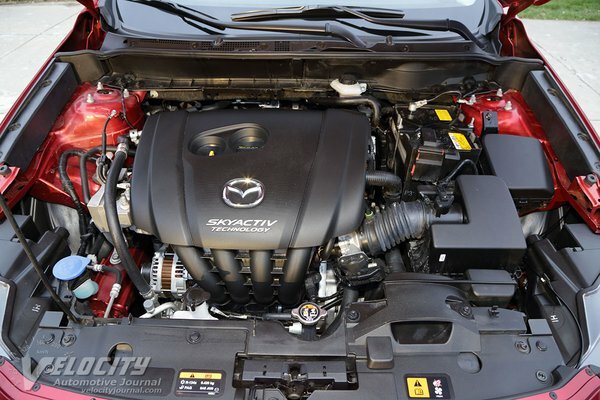 The engine is buzzy and not particularly refined at low and midrange RPM. Braking performance is remarkable: the all-disc setup and low curb weight ensure fast, sure stops. 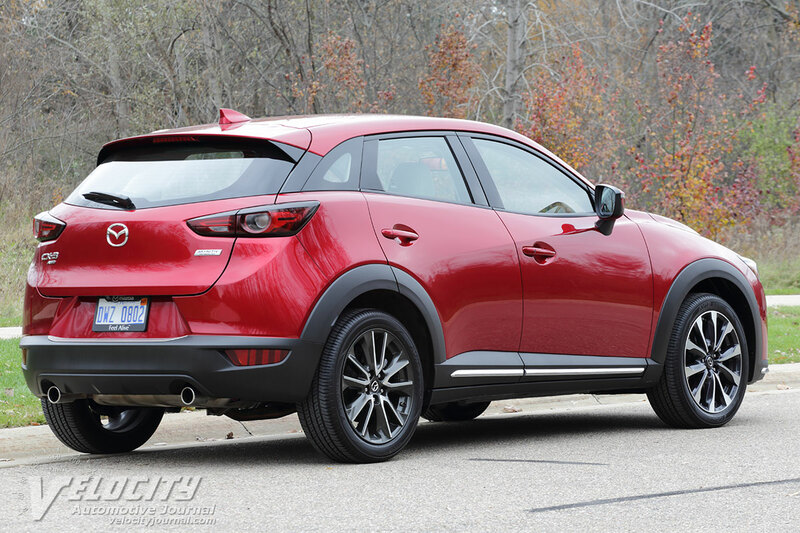 On the highways, the CX-3 feels stable and secure for a small SUV. Road and wind noise are reasonably subdued. 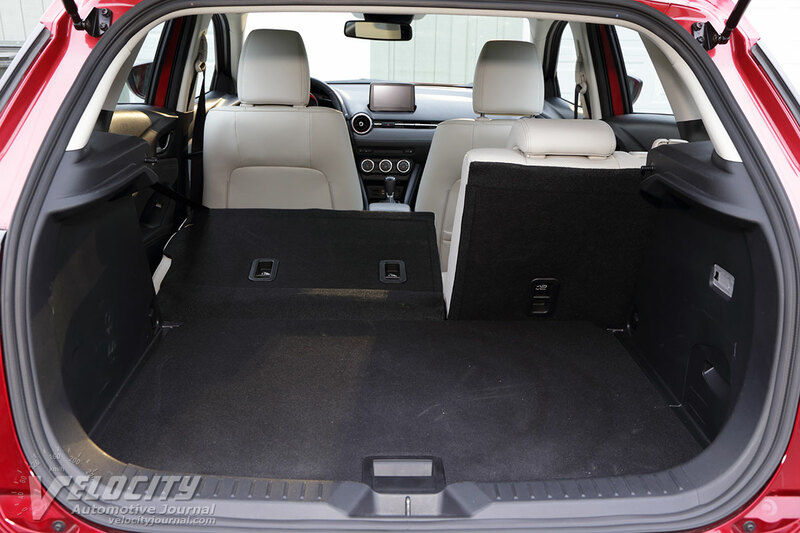 The tall sixth gear ensures that engine revs are usually below 3,000 RPM, but with the torque peak at 2,800 RPM, throttle response is decent when lightly loaded. 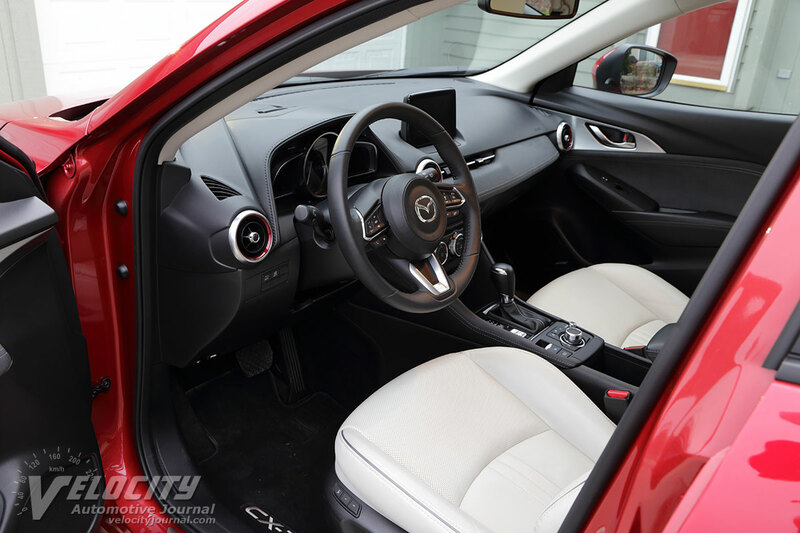 Mazda chose gear ratios optimized for maximum fuel efficiency. Both fifth (0.708:1) and sixth (0.599:1) gears are overdrive. The 6-speed automatic is calibrated for nearly seamless shifts, but shift points are at low revs to maximize fuel efficiency. Selecting the Sport mode allows higher engine revs before shifting for faster acceleration. We often resorted to the manual shift mode to harness all available torque, which isn't all that plentiful. Shorter ratios (numerically higher) in second and third gear would certainly improve acceleration, but with an inevitable increase in fuel consumption. The CX-3 is certainly a competent compact SUV, but in a rapidly growing segment, this Mazda will have difficulty standing out. We think that the CX-3 Sport and Touring models are the best values in the lineup. The CX-3 Grand Touring is simply too expensive for what it offers, especially when the larger CX-5 Touring AWD starts at $28K. 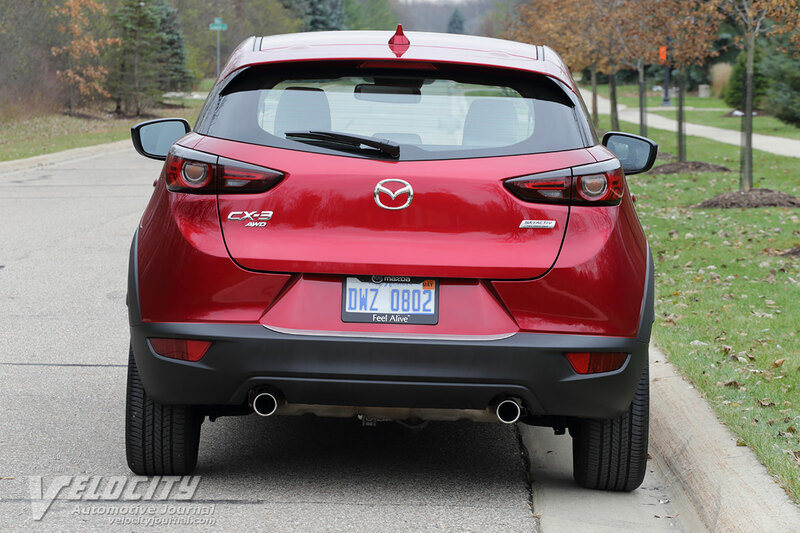 So although we like the CX-3, most Mazda customers in the US will likely be better served by opting for the CX-5.